Also available is the FMR 55 digest for easy online access to all the articles published in FMR 55. It provides for each article: the title, the author(s) and their affiliation, the introductory sentences and links to the full article online. The digest will be available online and in print in all four languages. If printing out the magazine or digest, please note that they are all published in A5 format (half of A4). In order to print them out properly, please use your printer’s ‘Booklet’ setting. Please help disseminate this issue as widely as possible by circulating to networks, posting links, mentioning it on Twitter and Facebook and adding it to resources lists. We encourage you to circulate or reproduce any articles in their entirety but please cite: Forced Migration Review issue 55 www.fmreview.org/shelter. We are grateful to the following for their financial support for this issue: Better Shelter, Happold Foundation, Hunter and Stephanie Hunt, Norwegian Refugee Council, Open Society Foundations, Suricatta Systems, Swiss Federal Department of Foreign Affairs, UN-Habitat and UNHCR (DPSM). 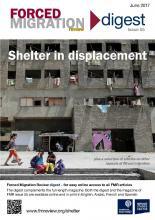 Throughout this issue of FMR we have used images depicting a wide variety of types of shelter, including shelters constructed by displaced people, architect-designed housing units, and urban structures ‘re-purposed’ for refugees’ use. Some of the shelters are based on the concept of ‘building back safer’. Others reflect the paucity of suitable materials available. In other images displaced people are being hosted in local families’ homes, while elsewhere they are clearly renting sub-standard accommodation. There is no one image that defines ‘shelter in displacement’. So how did we decide what image to use on the front cover of this issue? We wanted to avoid the classic image of the destitute refugee living in a makeshift twig shelter covered in rags and bits of plastic – although for some people such shelters are still their only option. And yet the neat prefabs springing up in various locations around the world are also not the reality for most IDPs and refugees. In the end we decided to reflect the fact that over recent years displaced people increasingly find their own shelter, particularly in urban areas, where their comparative invisibility may be both an asset and a risk.